These tangily sweet and spicy, cranberry-glazed chicken drummettes are sure to be a hit, especially with those who love hot wings. Combine all ingredients, except drummettes, in large resealable plastic bag; mix well. Add drummettes. Seal; turn bag to coat chicken. Refrigerate at least 1 hour or overnight. Pour chicken and marinade in ungreased 13 x 9-inch baking dish. Bake 40 minutes or until chicken is no longer pink near bone, turning 2 or 3 times and brushing with marinade. 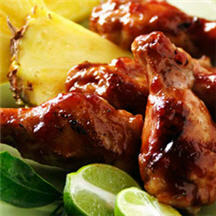 Transfer chicken pieces to serving dish; discard any remaining marinade.